Read here about weaving principles and how they help explain tensegrity. Weaving is a textile craft in which two distinct sets of yarns or threads, called the warp and the filling or weft (older woof), are interlaced to form a fabric or cloth. The warp threads run lengthways on the piece of cloth, and the weft runs across from side to side, across the bolt of cloth. Cloth is woven on a loom, a device that holds the warp threads in place while filling threads are woven through them. Weft is an old English word meaning "that which is woven". The way the warp and filling threads interlace with each other is called the weave. Snelson identifies weaving as the "mother of tensegrity." He asserts that there are two weave structures: a two-way plain weave made up of squares, and a three-way triangle/hexagon weave, used most often in basketry, which are then varied in various ways. "A single weaving event, two filaments crossing and in contact with one another, each warping the other where they press in contact is, in itself, an elementary structure. At the point of crossing the two threads create dual helical axes one clockwise, right-rotating and the other counterclockwise, left-rotating... These dualites, these reversals of right and left rotation at every crossing, provide nature’s first lesson in fundamental structure. The helical phenomenon plays a vital role in determining whether two separate parts will or will not link together." Snelson then goes on in the work to identify five basic weave cells that are critical to tensegrity structures. He illustrates these with a rattan basket-weave ball from Thailand and a carved ivory ball with basket-weave pattern from China. The book goes on to show how tensegrity masts are woven or braided columns. The struts of the tensegrity column above (E. Q. Tower) have a weave pattern although they are not directly connected to one another. Left, a woven vinyl column. Center, a Kellum's grip made of woven wire roap. Right, E. Q. Column by Kenneth Snelson, shown with overlayed blue shading between struts to identify the weave pattern.
. "Let’s blur the distinction of individual muscles in isolated action, and see another design in the fibers. The individual fibers that make up all musculature lay along diagonals. Most of the discreet muscles also lay along diagonals. What begins to appear, if one gives up the idea of isolated muscle groups and allows muscles to transit boney structures is a pattern of diagonal lines.12 Crossing spirals of muscular fiber become apparent. For example, a left pectoral muscle blends with a right intercostal that joins an oblique muscle that blends into a gluteal muscle.13 This is exactly countered by a matching helix (a spiral in 3-dimensions) from the right pectoral on down. Start at another point and the same type of helix emerges. An iliacus leads to a quadratus lumborum that wraps into the lattissimus on the other side of the body and so forth." This comparison to weaving is in line with Snelson's conception of tensegrity. Ohlgren continues, "Bones... assume a structural dimension that is in addition to levers and to spacers inherently more in tune with a tensegrity view of the body’s mechanics. With the use of a couple of analogies, this new model can be appreciated. A machine that is designed for a consistent relationship to gravity is liable to sustain serious damage when forces outside its design-frame are applied to it. If this were indeed our design, few of us would survive our childhood in working order. Try putting a computer through the innumerable crashes of a typical youth and imagine what working order it might be in, to say nothing of its appearance. To what do we owe our remarkable resilience? From football, to skiing, to tumbling we are able to sustain a tremendous array of reckless experiments and live to tell about it. Although our muscular tube design is not precisely an interweaving of diagonal fibers, as in a basket, the basket-weave analogy is helpful... For a certain generation this might bring to mind the straw 'Chinese handcuffs'. These were tubes of woven straw which expanded when compressed and contracted when elongated, allowing one’s fingers to enter the tube from both ends but preventing the withdrawal of the fingers when they were pulled away. After either compression or elongation or twisting, the spiral double helix weave pattern will always return to its original shape by its own momentum. This model is closer to a spring than a lever/pulley model and reflects our spring-like resiliency." 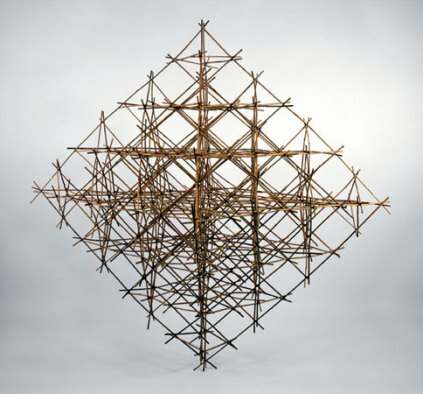 Whiteley, Rigidity and Polarity II: Weaving Lines and Tensegrity Frameworks. In Geometriae Dedicata 30 (1989) 255-279. This page was last edited on 28 November 2018, at 18:06.